Dignissim • Feugiat ut ullamcorper sed diam wisi euismod tincindunt dulce et decorum est. At 87, the Rev. C.T. Vivian can still recall the moment, decades after the height of the civil rights movement. "There is a balm in Gilead," they sang, "to make the wounded whole." As the nation pauses Jan. 16 to mark King's legacy, those who knew him say hymns, spirituals and other religious songs helped carry him through troubled times. The spiritual fit King's unique circumstances, said Vivian, who recently was named vice president of the Southern Christian Leadership Conference, the civil rights organization co-founded by King. "The average Christian doesn't have to pick up his phone when it rings and think about somebody killing him or his children," Vivian said. "The average Christian didn't have any of that." Although King had other favorites, his widow, Coretta Scott King, wrote in her autobiography that it was "Balm in Gilead" that "my husband quoted when he needed a lift." King also was comforted by "Precious Lord, Take My Hand," a hymn sung by Mahalia Jackson at his 1968 funeral and by Aretha Franklin at the dedication of the new King memorial in Washington last year. "Through the storm, through the night," it goes, "lead me on to the light." Accounts of King's life say it was the last song he requested, moments before he was shot on a motel balcony in Memphis, Tenn.
Lewis Baldwin, a religious studies professor at Vanderbilt University who has written on King's cultural roots and prayer life, said the song addressed some of the helplessness the Baptist minister must have felt as he constantly faced threats and attacks. "I think that song spoke of that," Baldwin said. "Give me courage, give me perseverance." Beyond music that encouraged him, Baldwin said King particularly appreciated songs such as "If I Can Help Somebody" that moved people toward the goal of creating King's "beloved community." "He cherished the great hymns of the church, particularly those that spoke to the ethic of service," he said, "and to be involved in changing the quality of life of human beings." Music such as the movement's iconic theme song, "We Shall Overcome," and others that King favored incorporate timeless values, Baldwin said. "Those are not songs that have meaning confined to the 1950s and '60s." King particularly enjoyed Jackson's rendition of "Amazing Grace," Vivian said. 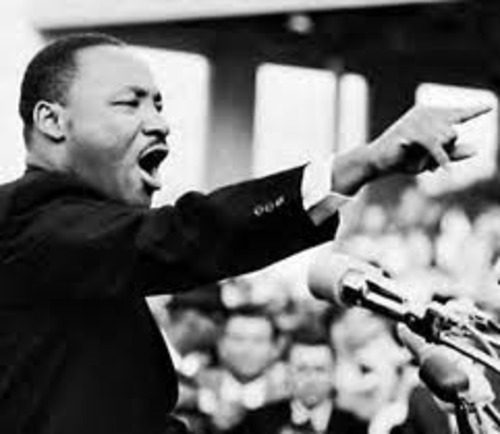 After she sang the spiritual "How I Got Over" at the 1963 March on Washington, Baldwin said, King later wrote her to say she set the tone for his "I Have a Dream" speech. His love for a range of music was reflected in his sermons  in which he sometimes recited lines or whole stanzas of sacred songs. In a 1957 sermon, he said the Easter message was reflected in such hymns as "All Hail the Power of Jesus' Name" and "In Christ There Is No East or West" as well as words from the "Hallelujah Chorus" of Handel's "Messiah." In that way, lyrics became more important than the musical notes that accompanied them, helping King deliver his message, said James Abbington, who teaches church music and worship at Emory University's Candler School of Theology. "King was a trained theologian," he said. "Music becomes the platter or the handmaiden for theology." Friends and scholars say he often would sing with a group but seldom as a soloist. In her autobiography, his widow recalled that he once ended up singing "His Eye Is on the Sparrow" as an unintentional solo and had to overcome "real stage fright" as he sang the whole song by himself. "I never really told him he couldn't sing," wrote his widow, a trained classical vocalist, in her 1969 book. "He had a good voice for a choir." "I refuse to comment on the grounds it might make me sound nasty," he said. "His gift was speaking more than singing, but he loved music."